People often mistake homemade muffins, or even store bought ones as healthy alternatives to other treats. This could not be further from the truth. Problem with muffins is the empty calories in way of added Sugar and Butter. Muffins from your favorite coffee shop with a crunchy top contain a crumble made of sugar, butter, and all-purpose flour. These are empty calories, with no nutritional value and will go straight to those hard to lose fat areas. cut the amount of sugar but still keep the sweetness. cut the amount of butter or other added fat contact but still keep the moist texture. last but not least, have a crunchy flavor that we all love from fine bakery style muffin tops. 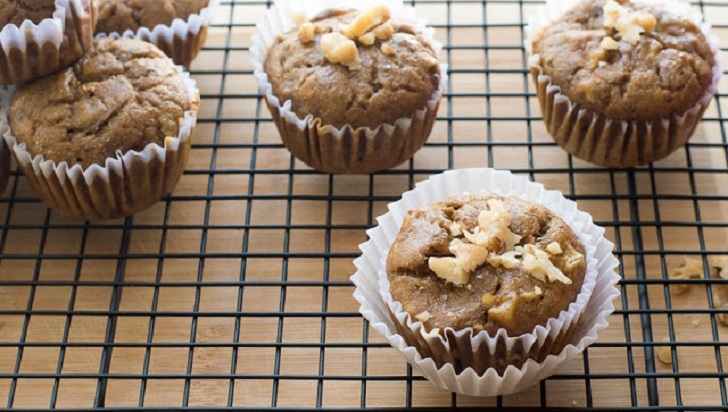 These Banana Nut Muffins with Apple Sauce are so fluffy and moist, I bet no one can guess they’re healthy muffins. They’re easy to make, too, with basic ingredients and only one mixing bowl! Grease or line 12-hole muffin pan. Dry ingredients — In a medium-size bowl, mix (using a sifter to remove any lumps) Whole Wheat flour, all-purpose flour, baking soda, salt and set aside. Wet ingredients — In a large bowl, cut bananas into little pieces and add to the sugar. Using the hand blender, whip up this mixture until it starts to look like banana cream, 3-5 minutes. To this mixture, add cooled melted butter, eggs, vanilla and mix for another 2 minutes. Add the apple-sauce and mix for 1-2 minutes. Fold dry ingredients into wet with a rubble spatula. Chop up the walnuts and coat them with 1tbsp of flour before adding to the wet mixture. Fill up muffin tins almost to the top. Option, sprinkle with finely chopped walnuts. Bake for 15-20 minutes. Check for doneness at 15 minutes by inserting a toothpick into the muffins, if it comes out clean, they are done. Cool on a wire rack and enjoy! As this recipe is low in sugar and made with all natural ingredients it’s best to keep leftovers in the fridge for up to 4 days and warm-up in the microwave, if desired.